Highly versatile solution for professional film sound: Rugged all-in-one wireless system for professional interviews and recording - features EK 500 G4 camera receiver and SKP 500 G4 pro plug-on transmitter to transform any wired shotgun or handheld microphone into a wireless one. The professional‘s choice for broadcast quality sound. Providing the highest flexibility for your video sound and field recording applications. A robust wireless microphone system that offers ultimate sound quality, simple mounting and ease of use. 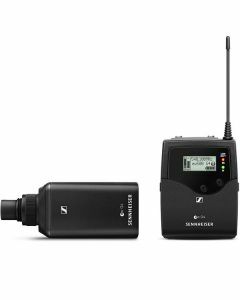 The phantom power-equipped SKP 500 plug-on transmitter adapts any wired shotgun or handheld microphone for a wide range of wireless applications, from field interviews to off-camera boom work. In the streets while shooting a documentary or on the red carpet for an interview. On a large film set or in a production studio. G4 captures the magic with such ease, almost as if you had planned it for years. As the simple mobile solution and a reliable partner on every set, evolution wireless has become the leading choice amongst filmmakers and journalists alike for its ease of use, versatility and reliability. The perfect solution for film-makers on large sets, operating up to 32 channels in parallel. The amazing bandwidth of up to 88 MHz and the increased RF output power ensure highest safety, no matter the conditions.